On Saturday, I went to the York House School Fall Market and I have to say, “It’s about time”. Every autumn, for the past 10+ years, I have passed the fair signs, which line Granville Street, and wondered what the event was like. Now that I have a child, I’m always on the look-out for deals on books, DVDs and toys. I finally got it through my head how ridiculous it is to pay full price for new toys when most toys are used for such a short time. The used toys I buy are like new and at his age, Caden, doesn’t understand “brand spankin new”. If it’s new to him, he considers it “new”. The fall market was extremely well organized. The Attic Treasures, Fashion Accessories and Fashion Repeats were located in an underground parking lot that seemed to go on forever. A Buzz Lightyear hockey jersey from Disney, a Seattle Mariners jersey and two Mickey Mouse baseball caps sum up my purchases in that area. The total came to a whopping $ 2.50. I’d hate to tell you what I spent on toys, books and DVDs, so I won’t. Let’s just say we are all Franklin, Bob the Builder, and Diego-ed out. Not to mention the golf clubs, toy cars, new Crayola finger paints, new Playdough fun factory and new (yes, new meaning unopened) Aquadoodle mat, I purchased. The new stuff has been put away for Christmas. 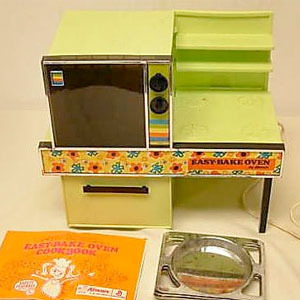 If you happen to have a girl, you would have been in heaven, I couldn’t help but stop in my tracks when I saw the brand new $6 Easy Bake oven…sniff…sniff…I LOVED my Easy Bake Oven as a kid in all it’s orange retro glory. 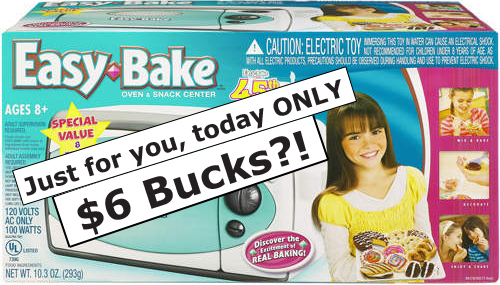 I was so tempted, but somehow I couldn’t see my son baking little cakes so off I went in search of Hot Wheels…sigh. In my travels, I spotted a pile of Groovy Girls dolls priced a $1 each. 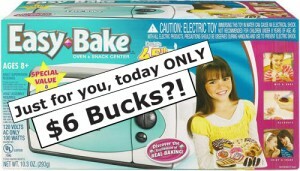 That’s just silly, they retail for $15….double sigh. Those were the highlights of the market for me. Although there was much more to see and do (eg: silent auction, bottle booth, cakewalk, haunted house), I was loaded down and broke so off we went. Had I been there on my own (ie: without husband and my “cutie pah-tootie”), I could have killed a couple of hours shopping but it wasn’t really a great place for small kids and husbands (at least my husband). Maybe I’ll get a chance next year. My hubby celebrated his birthday today. 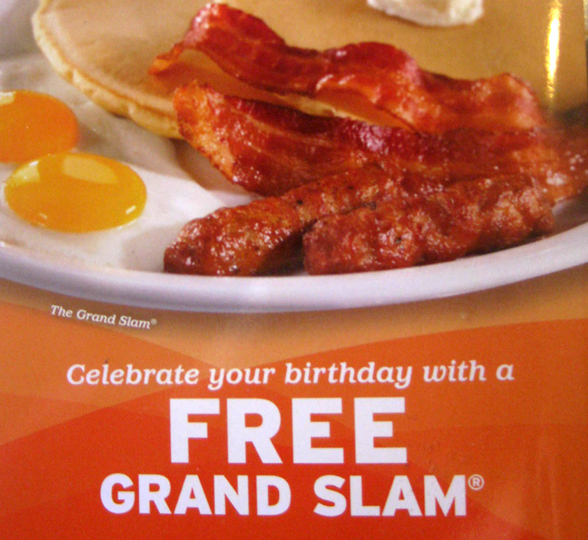 Yesterday, he told me that he wanted to go to Denny’s for a free breakfast. Sad but true. Regardless, that got me thinking. Where else could we get our hands on free food? It became a bit of an obsession for me, as I scoured the Internet into the night, looking for leads. 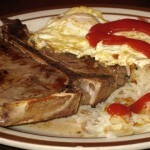 The result: Darryl ate a 13 oz T-bone steak, 2 eggs, hash browns and 2 pieces of toast for breakfast at Denny’s. His meal was free (regular price around $19). 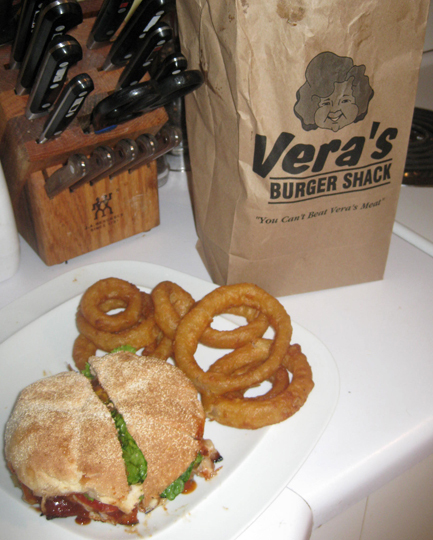 That was followed by a free BBQ Burger (regular price $9) at Vera’s burger shack for lunch. 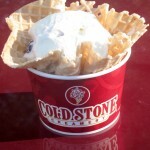 Later that afternoon, he downed a free scoop of key lime ice cream with blueberries from the Cold Stone Creamery (regular price around $4). Unfortunately (or you could say fortunately), we had a birthday dinner to attend that night or we would have continued on our free food quest. We were on a roll (no pun intended). 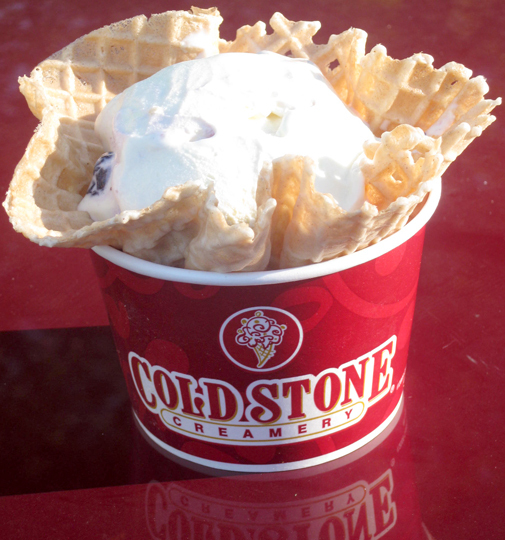 Thankfully, we still have a week to use the Baskin Robbins coupon. Whew! Next year, we’ll be more organized, so watch out. 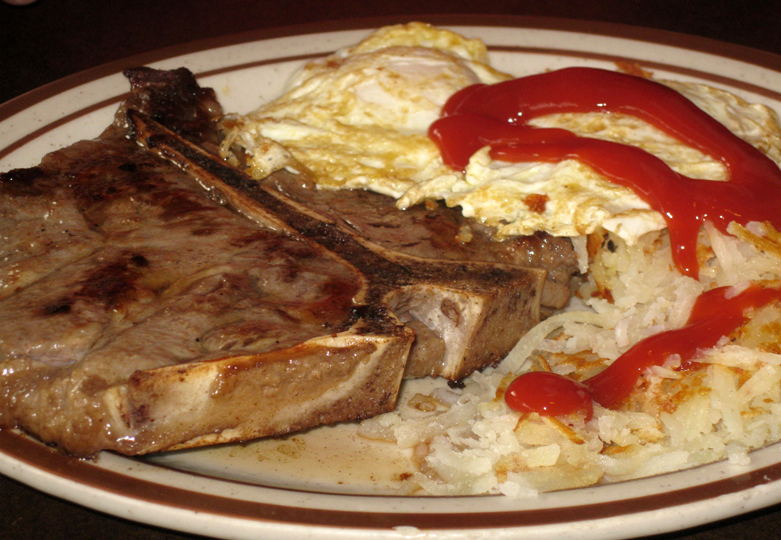 We’ll start earlier, travel farther and eat more. 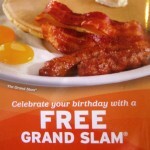 Why not, your birthday only comes around once a year. As a friend of mine likes to remind me, “Free is the best price”. Let me know if you come across any more deals in Metro Vancouver area, I’d love to add them to the list. 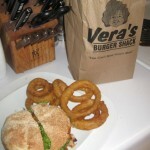 Note: Some of these deals require you bring another person to dine. Others want you to sign up well before your birthday; so sign up earlier so you don’t get left out in the cold. Also, be sure to bring picture ID with you, just in case. Boston Pizza – My “spidey sense” tells me they have something (appy or dessert thing) but I can’t find it on their website. Can anybody confirm this one? Milestones Grill and Bar – Free dessert (just ask, at least we did) or go online to get a birthday coupon where you eat free as long as you bring 3 friends with you who buy entrees ( I use the word “free” lightly).